My blog has been listed in the Blog Chicks Personal Blogs Directory! I attended a rather interesting talk yesterday on global climate change, science communication and the misinformation techniques used by climate change skeptics. The talk was given by John Cook, a climate communication research fellow at the Global Change Institute at the University of Queensland, Australia. John Cook is the lead author of a significant paper on climate change consensus entitled Quantifying the Consensus On Anthropogenic Global Warming in the Scientific Literature published in the journal Environmental Research Letters. Impressively the link to the paper was tweeted by Barack Obama! John Cook also created the website Skeptical Science and runs The Consensus Project which is described as “a peer-reviewed citizen science driven project conducted by volunteers at the Skeptical Science website.” (The Consensus Project, 2013). 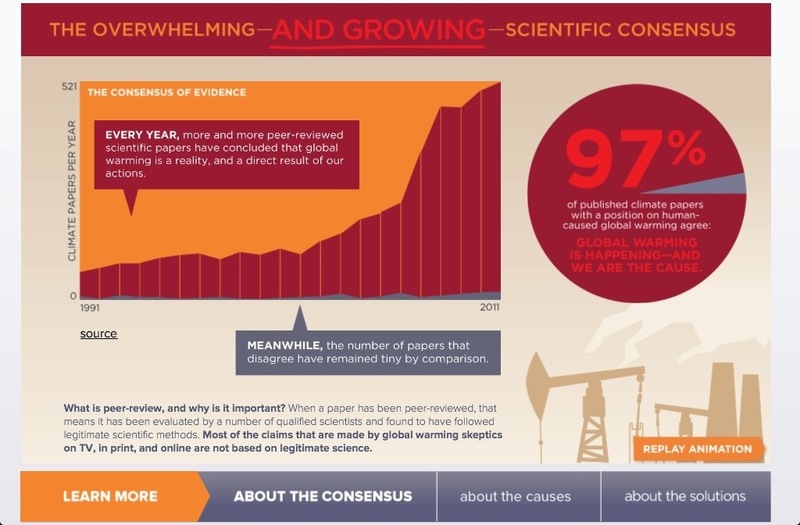 We analyze the evolution of the scientific consensus on anthropogenic global warming (AGW) in the peer-reviewed scientific literature, examining 11 944 climate abstracts from 1991–2011 matching the topics ‘global climate change’ or ‘global warming’. We find that 66.4% of abstracts expressed no position on AGW, 32.6% endorsed AGW, 0.7% rejected AGW and 0.3% were uncertain about the cause of global warming. Among abstracts expressing a position on AGW, 97.1% endorsed the consensus position that humans are causing global warming. In a second phase of this study, we invited authors to rate their own papers. Compared to abstract ratings, a smaller percentage of self-rated papers expressed no position on AGW (35.5%). Among self-rated papers expressing a position on AGW, 97.2% endorsed the consensus. For both abstract ratings and authors’ self-ratings, the percentage of endorsements among papers expressing a position on AGW marginally increased over time. Our analysis indicates that the number of papers rejecting the consensus on AGW is a vanishingly small proportion of the published research. In summary, the study found that 97% of papers that stated a position on human caused global warming endorsed the consensus that humans are causing global warming. The significant consensus amongst scientists through peer reviewed papers and extensive scientific evidence of global warming and the influence humans have had on this surely indicates human involvement in global warming. Hopefully this paper’s findings, the communication of this message, and innovative ways to combat misinformation from climate change skeptics and associated conservative media and politicians will enlighten the public to the reality of climate change. As I sat in the auditorium and listened to the misinformation used by climate change skeptics and I thought how terrible it is that scientific data and the scientific methods is suffering. What does the public think of science? Does conservative media influence the public to trust science less? I was immensely inspired to pursue science communication as a career, as there is such an important role for science communicators, especially in combating misinformation campaigns and presenting evidence that will enlighten the public and governments.